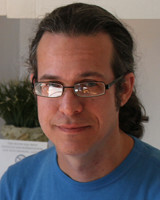 John is founder and webmaster of bhag.net, democraticpromise.org, and riverhousearts.net. He has worked as a policy director for Jobs Now Coalition in St. Paul, Minn. and as a labor market analyst and web designer for the State of Minnesota. He is co-owner of River House Arts LLC is a labor union member. His writing on democracy and the economy has been published nationally in Truthout and Science & Society, as well as in Workday Minnesota, Minnesota Employment Review, Minnesota 2020, St. Paul Villager, Duluth News Tribune, and Detroit Lakes Online. He was the featured speaker on union cooperatives at the Saarland Labor Chamber in Saarbrücken, Germany in 2014. His interview with artist Chuck Close is published online at Artzar.com and here at bhag.net. To provide feedback on the artist's work, please contact editor@bhag.net.